More Details Alo Yoga Moto High-Waist Sport Leggings Details Alo Yoga moto-style performance leggings in mixed matte/shine fabric. Approx. measurements: 28" inseam; 37" outseam. Mesh and biker-style trapunto quilted panels. High-rise elastic waist; hidden key/card pocket. Figure-forming fit. Full-length. Pull-on style. Nylon/spandex. Contrast, polyester/spandex. Machine wash. Imported. Alo Yoga Moto High-Waist Sport Leggings Details Alo Yoga moto-style performance leggings in mixed matte/shine fabric. Approx. measurements: 28" inseam; 37" outseam. Mesh and biker-style trapunto quilted panels. High-rise elastic waist; hidden key/card pocket. Figure-forming fit. Full-length. Pull-on style. Nylon/spandex. Contrast, polyester/spandex. Machine wash. Imported. More Details Alo Yoga Moto Full-Length Sport Leggings, Black Details Alo Yoga moto-style performance leggings in mixed matte/shine fabric. Approx. inseam: 27.5" (XXS) to 28.5" (size L). Biker-style trapunto quilted detail. Hidden key/card pocket in waistband. Low-rise elastic waist. Mesh detail below knee. Figure-forming fit. Cropped at ankles; pull-on style. Body, nylon/spandex; contrast, polyester/spandex. Washable. Imported. Alo Yoga Moto Full-Length Sport Leggings, Black Details Alo Yoga moto-style performance leggings in mixed matte/shine fabric. Approx. inseam: 27.5" (XXS) to 28.5" (size L). Biker-style trapunto quilted detail. Hidden key/card pocket in waistband. Low-rise elastic waist. Mesh detail below knee. Figure-forming fit. Cropped at ankles; pull-on style. 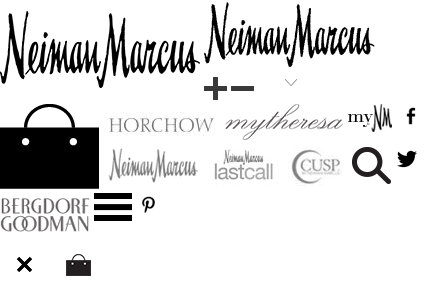 Body, nylon/spandex; contrast, polyester/spandex. Washable. Imported. 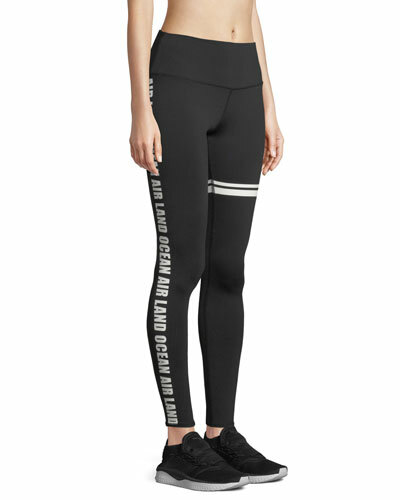 More Details Koral Activewear Forge Contrast-Panel Sport Leggings Details Koral Activewear "Forge" figure-forming leggings. Elastic waistband. Mid-rise. Logo detail at back waist. Cropped just above ankle. Pull-on style. Fabric 1, nylon/spandex. Fabric 2, nylon/XtraLife Lycra® spandex. Made in USA. 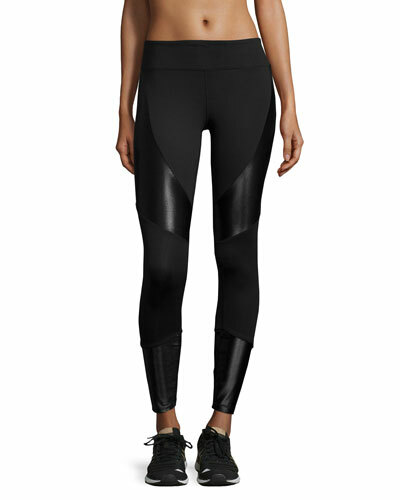 Koral Activewear Forge Contrast-Panel Sport Leggings Details Koral Activewear "Forge" figure-forming leggings. Elastic waistband. Mid-rise. Logo detail at back waist. Cropped just above ankle. Pull-on style. Fabric 1, nylon/spandex. Fabric 2, nylon/XtraLife Lycra® spandex. Made in USA.